Huntron provides training for our products through self-paced training courses, training at the Huntron factory or on-site training at your location. We cover Huntron Trackers, Huntron Access Probers and Huntron Workstation use. The courses are designed for new and experienced users. For your convenience, here are direct links to the available Huntron Tutorials. These are a great first resource to help you learn the use of Huntron Workstation. CAD Import Tutorial for Workstation 4.3 - Tutorial covering the import of CAD layout data into Huntron Workstation using Unisoft ProntoView-Markup. CAD Import Tutorial for Workstation 4.2/4.1 - Tutorial covering the import of CAD layout data into Huntron Workstation using CAMCAD Pro. 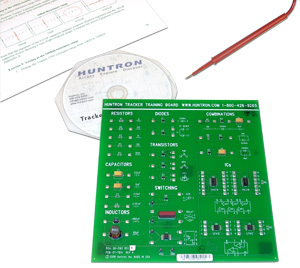 Huntron Workstation Tutorial for DMMs - Tutorial guiding you through using supported digital multimeters in Huntron Workstation. Huntron Workstation Tutorial for Oscilloscopes - Tutorial guiding you through using supported oscilloscopes in Huntron Workstation. This course covers the effective use of the software controlled Huntron Trackers as a troubleshooting tool as well as the development of basic test routines. The class lasts two days and students are responsible for their transportation, meals (Huntron provides lunch on class days) and lodging expenses. Included is plenty of hands on experience and students are requested to bring samples of the same type of printed circuit board (1 good and 2 defective; more if possible) so they may learn troubleshooting techniques and develop test programs on familiar PCBs. A working knowledge of the Windows OS is essential. Cost is $295.00 per student. No charge for up to two people with the purchase of a Robotic Prober system. (Good for up to six months after purchase). NOTE: The Huntron Tracker Training Workshop will be conducted using the Huntron Workstation version 4 only. This course is suitable for all variable range Trackers including the Tracker 3200S, Tracker 2800/2800S, Tracker Model 30* , TrackerPXI* , Tracker 2700/2700S, ProTrack and Tracker 4000. Part number: 98-0515 BUY NOW!